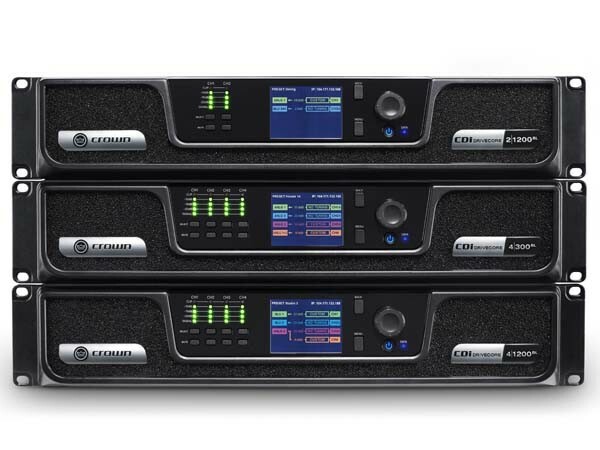 Building on the success of the Crown DriveCore Install Series, the new line of high-performance amplifiers can be deployed in a broad range of global installations with minimal effort. Developed for commercial sound installation technicians and integrators who seek streamlined equipment with modern features, the CDi DriveCore Series represents the best performance-for-value amplifier line on the market. Emilian Wojtowycz, Product Manager, HARMAN Professional Solutions observes that venues such as bars, restaurants, worship facilities and retail spaces need high quality amplifiers that offer premium performance, without the premium price tag. HARMAN has leveraged their innovative and multi-patented DriveCore technology to develop an entirely new line of versatile amplifiers that combine robust functionality with flagship features, bringing high quality performance to any sound system installation, all at a reasonable cost. The CDi DriveCore Series also delivers high-performance sound and reliability through Crown’s multi-patented DriveCore technology. The CDi DriveCore line provides Digital Signal Processing (DSP) and the option for digital audio transport with BLU link for higher quality sound. Crown amps equipped with DriveCore technology have up to 500 less parts than conventional amplifiers, delivering greater reliability. Instead of load monitoring, the CDi DriveCore Series focuses on the right speaker tunings for installations. The amplifiers, therefore, offer the essence of DriveCore without options that aren’t needed in many venues. Key features of the CDi DriveCore Series include 2 or 4 channel models at 300/600/1200-watt output power ratings; 70Vrms and 100Vrms direct output for use in global installations; front panel screen and controls for simple setup allowing customers to quickly recall JBL speaker tunings, configure amp inputs and outputs, and modify DSP settings; and bridgeable output channels doubling power output by driving two output channels as one, resulting in flexibility of use for zoning in constant voltage systems, or larger subwoofer use for performance and higher-volume SPL applications. The CDi DriveCore Series power amplifiers also feature a space-saving design ideal for reducing rack space in renovations and new construction projects; additional power points; industry-standard control options including GPIO and aux port control, AMX integration for use with 3rd party controllers, and compatibility with BSS Contrio Wall Controllers; and Energy Star 3.0 certification and highly efficient power modes enabling customers to maximise their investment in audio systems. Audio, video, lighting and control systems by HARMAN Professional Solutions are available in Australia through Jands, a leading distributor of branded sound, lighting and staging equipment.